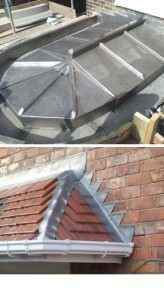 Rawdon Roofing Construction Services , are specialists in roofing leadwork services. Lead is an exceptional material for roof coverings, to cover flat roofs, to line valley gutters and to cover a wide variety of connections between slate/tile work and masonry, chimneys and to waterproof the junction between tiles and brickwork, or tile-to-tile junctions which are vulnerable to penetration by water, such as gullies. A lead ‘soaker’ is a sheet of lead placed under the tiles at a join, for example, against a wall covered with step flashing to form a waterproof seal. Where terracotta ridge tiles maybe inappropriate, for example on a small porch roof, a hip may be sealed with a ‘hip roll’, lead flashing wrapped round a wooden pole to give a ridge.